Where are the Cabins located? Blackburn Cabins are just about a mile out of McCarthy, and about 4 miles from Kennicott. From where you park your car at the footbridge, we are just over a mile. But not to worry, we offer a ride to and from the footbridge when you arrive and take off on your next adventure! How do I get to McCarthy? Fly! Drive! Or shuttle! The nearest major airport is in Anchorage. From there, most folks rent a car and make the 8 hour drive to McCarthy. Car rental agencies that allow their cars on the McCarthy Road include Alaska 4×4, A1, Go North, Midnight Sun, Budget, Alaska Adventure, Alaska Express, Levi, or Alaska Car & Van. Or if you’re really up for an adventure, rent a motorcycle from Alaska Motorcycle Adventures and ride right up to the front door of your cabin. If you’d rather not drive yourself, you can take a shuttle bus with Wrangell-St. Elias Tours. And if you’d prefer to not be in a car at all, you can fly in with Copper Valley Air on their bi-weekly (every Monday and Thursday) mail plane or charter a private flight with Wrangell Mountain Air. How can I get from McCarthy to Kennicott? The options are walking, biking, or taking a shuttle bus. We provide transportation to and from the footbridge upon arrival and departure. Bicycles are provided for the duration of your stay. You may also take the McCarthy Kennicott Shuttle between McCarthy and Kennicott for $5 per person each way. What kind of activities are there to do in the area? McCarthy and Kennicott are known for the Wrangell-St. Elias National Park and Kennecott Historic Mines. Talk to us first about glacier hikes and hikes to the mines. We offer personalized hikes for our guests, with usually 2 but no more that 4 people per guide! Feel free to ask us about what to do in the area. We can steer you in the right direction! Are there restaurants in town? It’s been said that some of the best food in Alaska is found in McCarthy! There are a lot of restaurants around town. Don’t worry, it’s a small town, you’ll find em all! Coming on and off the glacier in Kennicott, Meatza Wagon food is world famous. There’s always something happening at The Potato. Of course, there’s always The Golden Saloon. And Chris Epton is grilling up the best burger just outside of town at Glacier View. But anywhere you eat, it’ll be a treat! Is there a store in the area? There is a small general store in McCarthy that has a few basic odds and ends. You can buy everything you need to cook up a meal back at the grill at the cabins, or for a packed lunch out on a day hike! Is there gas available for sale in McCarthy? We recommend filling up in Chitina, at the start of the McCarthy Road. Just count on no, but in an emergency, it can be found! It is the end of the road, you know! What time is Check In and Check Out? Check In is (roughly!) at 2pm and Check Out is at (roughly!) 11am. We’re pretty flexible. It’s your vacation! 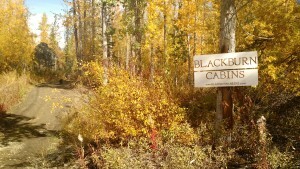 Do you get internet at Blackburn Cabins? At this time, we don’t offer WiFi. Some phone services work out here (Verizon, CVT, and Sprint is hit-or-miss). There is a Copper Valley Telephone hot-spot in McCarthy and Kennicott. And sometimes it’s possible to find WiFi at local restaurants around town. What do you do with garbage? The answer is that everything that comes in here has to go out, get burned, or buried. We ask that if possible, you take you trash with you. If not, we recycle aluminum cans, tin cans, carboard, and glass. We burn paper and toilet paper. The rest is stored in bear-safe containers until it can be hauled out to the nearest landfill, which is 130 miles away! Is there a place to stay halfway between McCarthy and Anchorage? We recommend both our friends Eric and Cynthia at Glennallen’s Rustic Resort B&B, and Patty at Golden Spruce Cabins! Are you pet friendly? We do allow dogs! All pets must be registered and we ask that they not hang out on the beds. We have a max of 2 dogs/cabin and cleaning fee of $20/pet/night. Please don’t leave pets unattended in your cabin, unless given prior approval. Guests are responsible for all property damages and/or personal injuries resulting from their pet. Can you see Russia from McCarthy? I’ve climbed the highest ridge in the valley here (albeit not near the highest ridge in the Wrangell Mountains). Although it was a very clear day, I still was unable to see Russia. Maybe next time I’ll try a higher ridge.